Apple's new iPad Pro is here, boasting 5.6 million pixels packed into its 12.9-inch Retina display, along with a powerful A9X processor that actually outclasses the new 12-inch MacBook. 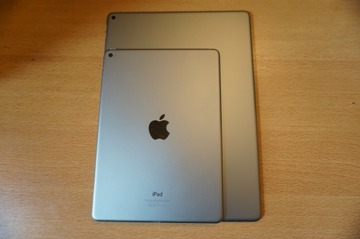 AppleInsider offers a first look at the jumbo-sized, top-of-the-line iPad. For Wednesday's launch, we picked up a 128-gigabyte space grey iPad Pro, priced at $949. The new iPad also comes in silver and gold, while a 32-gigabyte capacity is priced at $799, and a top-of-the-line 128-gigabyte model with LTE radio is $1079. 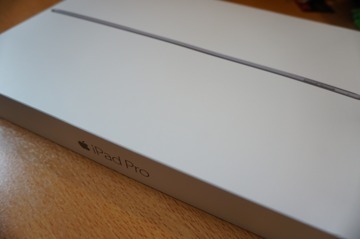 Right out of the box, the iPad Pro is familiar, with a design essentially identical to that of the iPad Air 2 and latest iPad mini 4. 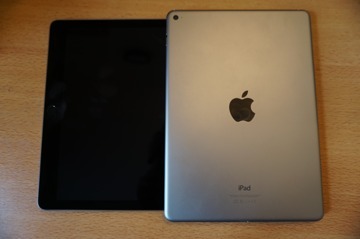 But the 12.9-inch display make this tablet noticeably bigger and heftier than the iPad Air. 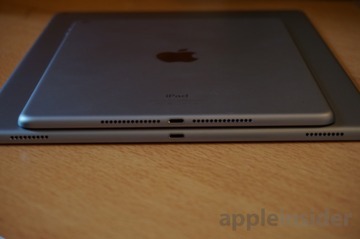 iPad Air 2 atop iPad Pro. Even still, the iPad Pro weighs in at about the same weight as the 9.7-inch first-generation iPad, released more than five years ago. 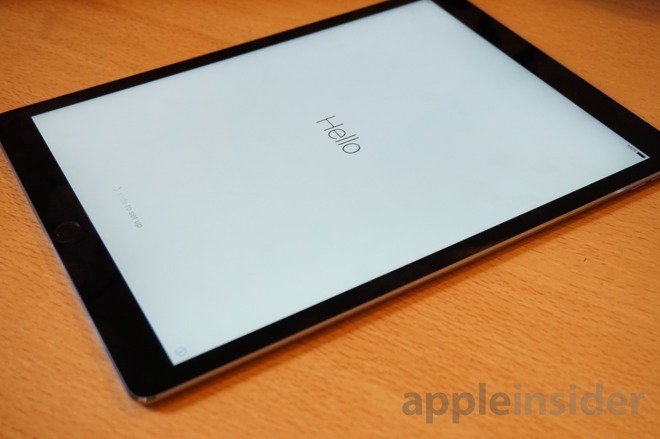 Upon setting up the iPad Pro, users will perhaps first notice that the onscreen keyboard is now not only full-size, but also boasts a dedicated row of numbers above the QWERTY letters. 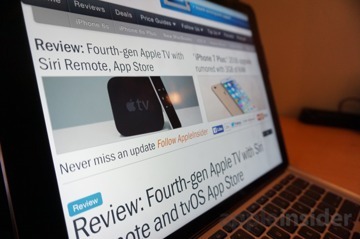 In addition, it also gains new virtual keys for caps lock, tab, apostrophe, semicolon and colon, brackets, backslash, and more. Top: iPad Air 2. Bottom: iPad Pro. 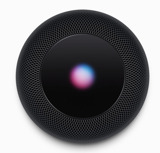 The four corners of the iPad Pro feature speakers that play stereo sound in any orientation. The speakers will dynamically switch accordingly as a user rotates the device, with the bottom to serving for deeper bass tones. 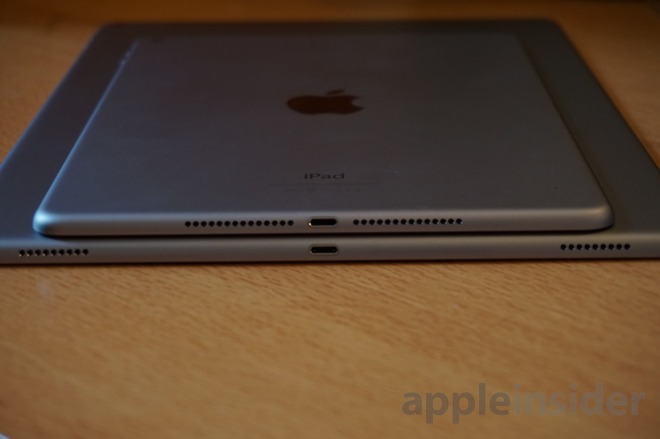 The iPad Pro speakers are noticeably louder than the iPad Air 2. 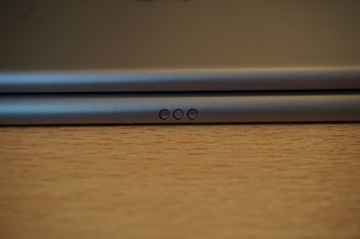 The other, most significant change to the iPad Pro hardware is the new Smart Connector, located on the left side of the device when held in portrait mode. While Apple's new Pencil and Smart Keyboard weren't available in stores just yet, we were provided a Logitech Create keyboard, which is also compatible with the new Smart Connector. 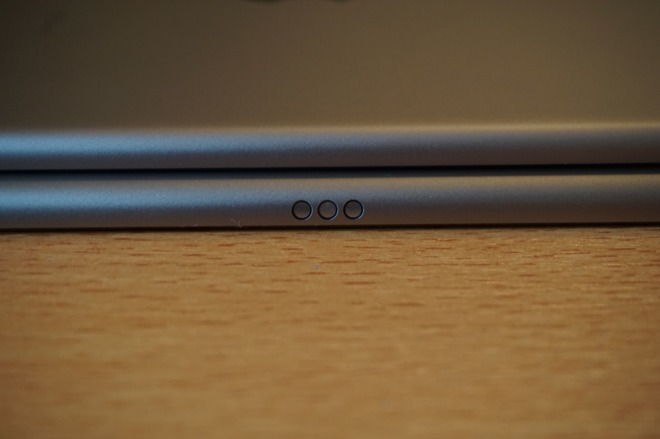 Connecting and using the Logitech Create with the iPad Pro is literally a snap: After inserting the top half of the tablet into the protective case side of the keyboard in landscape mode, the Smart Connector on the bottom satisfyingly locks into place with a magnetic connection. Though the iPad Pro and Create keyboard combo are expectedly top-heavy, the magnetic connection between the accessory and the tablet is strong and secure, and we were able to successfully use the combination on our lap. Because the keyboard is powered by the iPad Pro, there is no need to set up a Bluetooth connection or turn the accessory on or off. As soon as it was connected, the iOS 9 keyboard went away, and the backlight on the Logitech physical keyboard turned on. By default, the iPad Pro and iOS 9 do display a thin bar at the bottom of the screen for QuickType suggestions and other shortcuts, like adjusting fonts or inserting media in appropriate applications. These can be temporarily hidden by tapping an arrow in the bottom right of the screen. At first test, it all works well. 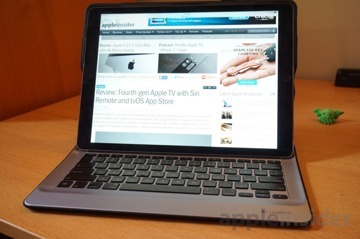 In fact, the entirety of this first-look was typed and published via the new iPad Pro with Logitech Create keyboard. 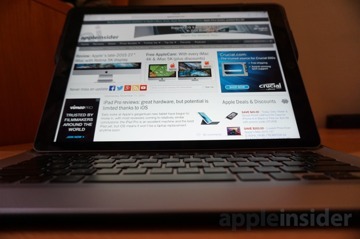 AppleInsider will have much more on the new iPad Pro, including our full review, in the coming days.